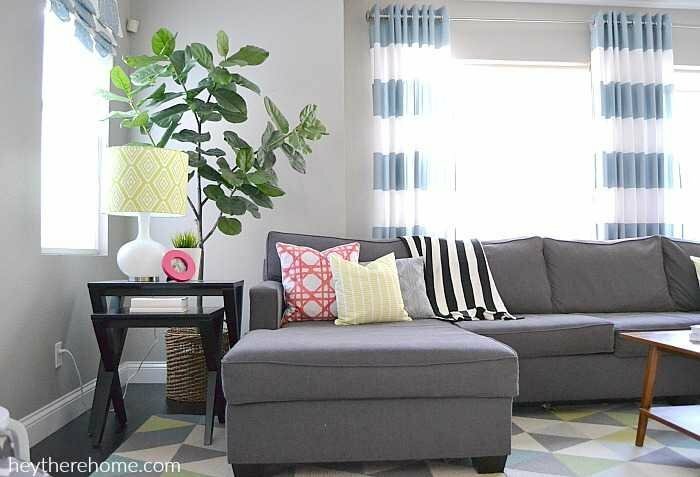 Lately I’ve been getting a ton of comments about the fiddle leaf fig tree in my family room. People have been asking how I’ve managed to keep it alive and so green. I guess it’s time I come clean. The truth is, although I would love to be a plant person, I’m not. In fact, I can’t keep a house plant alive for the life of me and frankly I’m done trying! I’ve got lots of other things around here that need taking care of and my house plants or this beautiful (and did I mention always green and perky) fiddle leaf fig tree isn’t one of them. Yep. It is fake. Artificial. Not real. A total phony. But what it is, is always green. Always perky, and never thirsty. My kind of plant! This post contains affiliate links for your convenience. Click here to read my full disclosure. Back when we were refreshing our family room and I was gathering inspiration, I realized that I was super drawn to plants. But since real plants and me just don’t get along I had to find a way to get the look without murdering yet another plant. I did a bit of research and found that Amazon is a great place to find quality artificial plants and trees and placed my order. Step 3: Secure your tree so that it stays perfectly straight. I was working on this project alone, so I tied some twine around my branch and then tied each end of the twine to the posts on my patio cover. You will need it to stay in this position for awhile, so don’t plan on just holding it. Step 4: Fill the pot with spray foam. Be aware that the foam will continue to expand for a day or 2, so don’t go all the way to the top. Step 5: Let it dry according to the instructions. Once it’s dry, add it to your room and don’t worry, your secret is safe with me! is a little dusting ever so often. For that I just take a damp paper towel and wipe the leaves and it’s good as new! I put mine in a big basket and love that it adds a ton of color and height to this corner in my family room. But more than that, I love that I never have to water it and it’s always green! So there you have it. The truth. You do what you gotta do to get the look you want. There is always a solution and it doesn’t have to involve becoming a plant lady. Add some green to your home with these quality artificial plant picks! I’m attempting to make a similar plant myself. Got all the required accessories but I’m confused about the size of the plastic pot I should get. Could you tell me the size of the the pot you used? 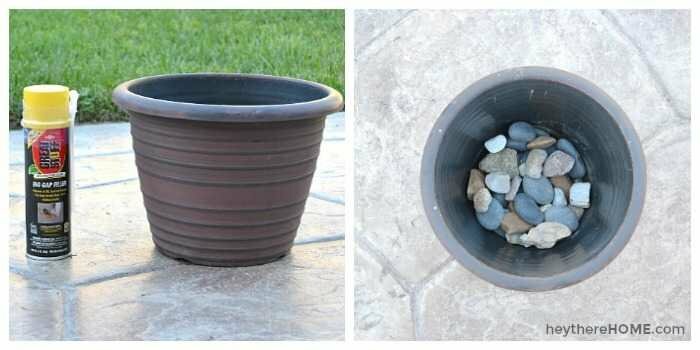 You think I should get an 8″ tall pot or 10″? I’d really appreciate a response! Thanks so much Simi! I think I used a 10 inch plastic pot. It was left over from some planting I did. It fits nicely into a big basket to cover up the ugly. 🙂 I can’t wait to see how yours turns out! Just came across your site — the link in the comments where you say you chose “this one” is no longer active. 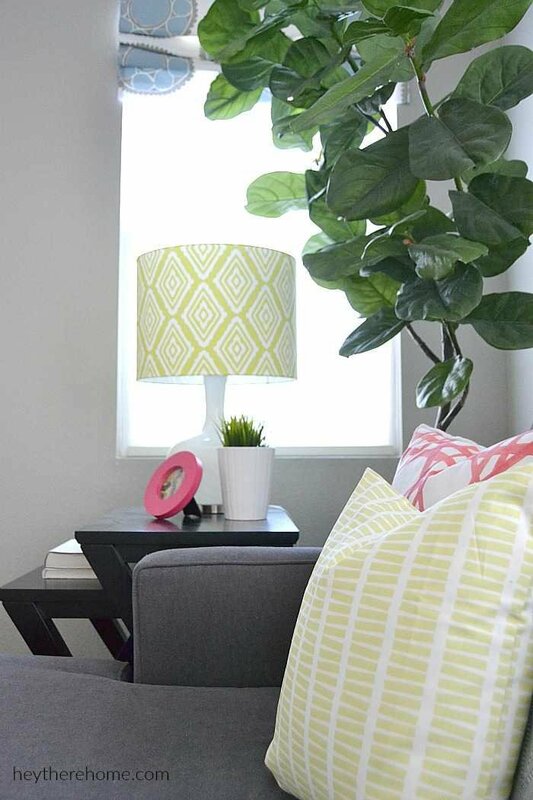 I really like the look of yours and the ones on AMZN if I do a search for Fiddle Leaf Fig don’t look as good…but maybe that’s just how they’re pictured and before they’re “shaped” by bending branches, etc. Can you please update with a link to one that’s as close as possible to the one shown in your pictures? Thanks! Hi, the specific branches I purchased are no longer available, so my link takes you to the potted tree. Thanks for stopping by! Your faux tree looks great but I’m a little confused about what product you used. 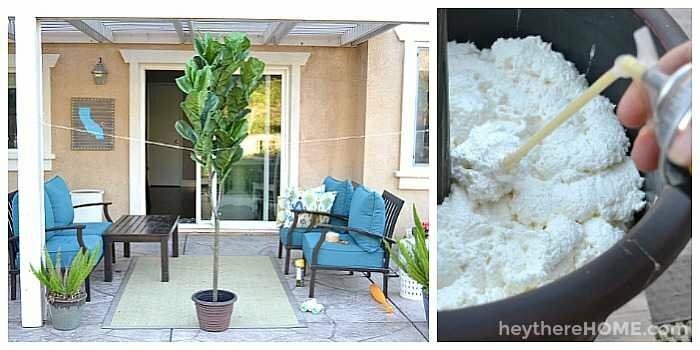 You said that you purchased 2 6 foot fiddle leaf branches that you planted in a planter your self.. but the link you gave took us to an actual faux fiddle leaf tree that was already in a pot. Could you clarify what branches you purchased. Thanks so much. Hi Cheri, the specific branches I purchased are no longer available, so my link takes you to the potted tree. Thanks for asking! I second Krystal and would love to know specifically which product you bought on Amazon to make your tree. Thanks! Hi Corey. 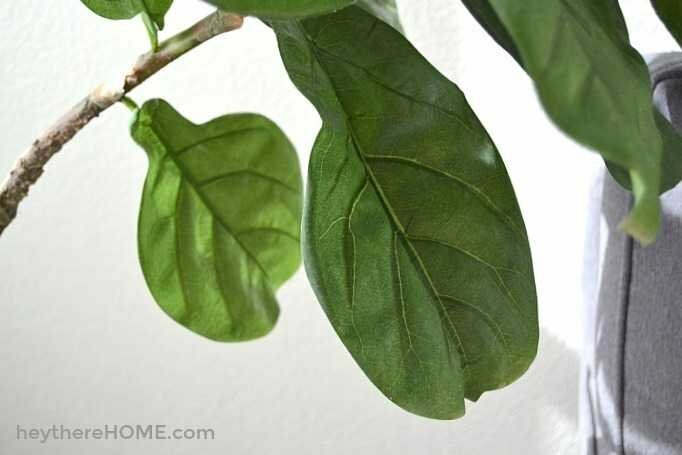 Can you tell me exactly which 6 foot fiddle leaf branches you purchased? I can’t seem to find them anywhere? 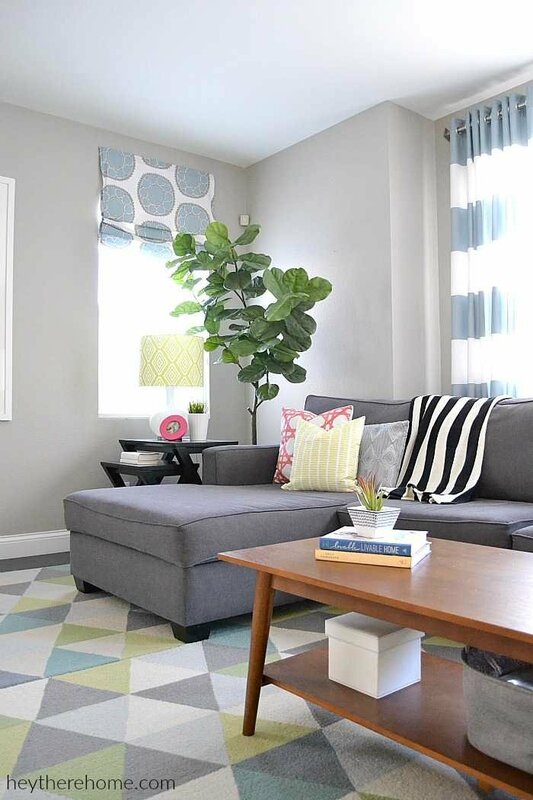 PS I love your fiddle leaf fig tree!! We think so much alike!!!!! I had to bring a bit of California to Minnesota when we moved and purchased a palm tree from Menards numerous years ago. I LOVE it! It looks awesome when I turn on the floor light and it shadows onto the ceiling. Another quick way to give it a quick dust is to vacuum it with the bush, makes quick work when in a pinch. Your secret is my secret! That is a great cleaning tip Paula! And a palm is the perfect addition of Cali for your home!